Springvale Foods Ltd supplies to trade only customers. Minimum orders apply (see below). For the purpose of this contract hereafter Springvale Foods Ltd shall be described as the “Supplier” and the entity placing an order shall be described as the “Customer”. There can be no variance to these Terms and Conditions of Business (The Contract) whatsoever unless by written documentation and signed by an authorised signatory of the Supplier. The Placing of an order by a Customer shall be deemed acceptance of these Terms in their entirety. Any verbal orders will be bound by these Terms. The Customer shall at the time of placing an order provide the Supplier with details of any special product requirements, for goods not normally stocked by the Supplier. Should the Customer order a product which is non-stock and ordered in specially for them and subsequently cancelled by the Customer, the Supplier reserves the right to charge as if the order has been fulfilled in its entirety, (refer to section 8). Prices are those applicable at the time of order placement, (price list available on request), and are subject to change without prior notification. All prices are exclusive of VAT which will be charged at the prevailing rate. The cost of carriage rate (minimum order – click here for information), is included within the sale of the product. 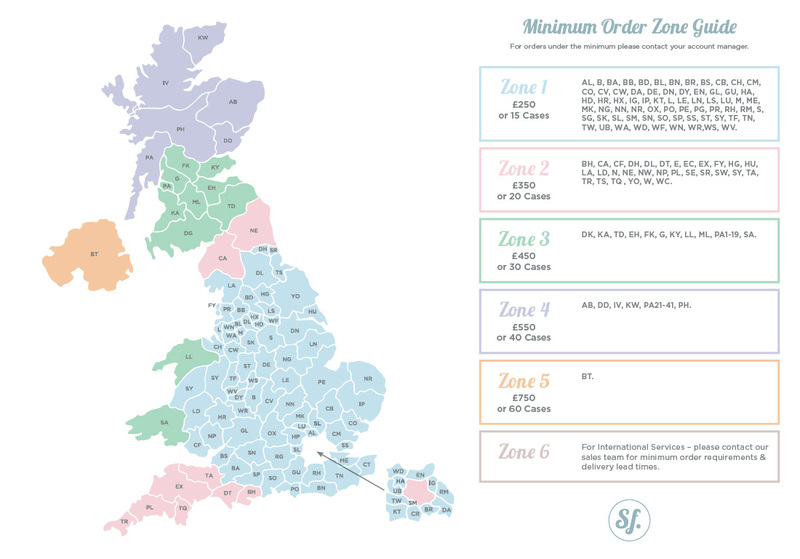 The Supplier will charge £8.95 for orders less than min order value, unless agreed otherwise with the customer. PAY NOW – Payment for the order placed will be made online by Credit/Debit card during the checkout procedure. STATEMENT – Payment due 30 days from date of invoice. All remittances received will be allocated to Invoices and credited to the Customers’ account in chronological order. All amounts overdue for payment shall, at the Suppliers discretion, bear interest at the rate of 4% above Bank of England base rate, for the period from the date of Invoice to the date of settlement. (Such penalty shall apply regardless as to whether Judgment in a Court of Law has been obtained). In addition all costs of recovery shall be borne by the Customer. Should at any time, the Supplier consider that the Customer be unable to settle their account by the due date, notwithstanding any other remedies, the reserve the right to demand immediate and full payment. In addition, the Supplier reserves the right to uplift goods supplied to mitigate amounts due to it and shall assess such goods and credit such values, as it deems reasonable. For any cheques returned unpaid from the Bank, there will be a charge of £10, which will be added to the amount due. Risk and therefore responsibility for Insurance of all items supplied shall pass to the Customer upon delivery within the United Kingdom. Title of goods supplies by the Customer does not pass until all outstanding amounts due to the Supplier, for any reasons whatsoever, have been settled in full, including any penalties for late payment accruing under these Terms or as varied by Government Legislation. No goods are supplied on a sale or return basis, unless specifically agreed with the rep.
Where applicable goods supplied shall be clearly marked by the Supplier to include description of goods, expiry date and storage instructions. Upon delivery it is the responsibility of the Customer to ensure that all items are stored in a suitable environment and at the correct temperature. All goods must be rotated in date order. The Supplier warrants that all goods supplied are to the best of their knowledge of merchantable quality and comply with all current legislation regarding the production process. Should a product be the subject of a recall then only that specific product code will be accepted and dealt with as described in clause 6.3. It is Incumbent upon the Customer to inspect all goods supplied upon delivery. The Customer must notify the Supplier of incorrectly supplied or damage items within two working days of delivery. (Time is of essence in this clause). Should the Supplier accept the validity of any claim regarding the quality of good supplied, liability shall be limited to replacement of the invoiced value of such items. The method of settlement of any claim is at the discretion of the Supplier. No third party claims will be entertained, as it is the responsibility of the Customer upon delivery of goods to ensure that they are used correctly for the purpose for which they are supplied. All goods are supplied subject to availability. The Supplier, at all times reserves the right, not withstanding any other remedies available to them, to refuse to supply and/or suspend further deliveries and/or stop goods in transit or fulfil any other obligations of this contract without having to give a reason, whether or not the Customer fails to fulfil any of its obligations under this contract. In the event of insolvency, liquidation receivership or bankruptcy or the Supplier having good reason to believe any of the aforementioned may apply, not withstanding any other remedies available to the Supplier, clause 5.2 of the contract applies. The Supplier shall not be liable for any non-performance whatsoever in whole or in part of its obligations as Inferred under the Terms of this contract for any reason or cause beyond its control. Such reasons shall include, (but not inclusively), strikes lockouts, disruption of power, transport, raw materials or fuel supplies, acts of war and civil disturbance. The Supplier accepts no liability whatsoever for goods prepared to a Customers specification (unless due to a preparation fault) and Invoices raised for such goods will be due for payment as detailed in Clause 4. The Customer may cancel an order up to seven days prior the agreed delivery date, (unless packaging or product has been ordered especially for the Customer), without penalty. Such notice must be given in writing by the Customer and acknowledged in writing by the customer and acknowledged in writing by the supplier. A Customers written notice of cancellation received within seven days of the scheduled delivery date may be acceptable without penalty at the Suppliers discretion. However a penalty charge of up to 100% of the order value may, at the Suppliers discretion, be applied. All dates and times given by the Supplier for delivery are estimated. The Supplier shall not be liable for any losses whatsoever as a result of a failure to adhere to any such dates and times. The Supplier shall be entitled to make partial deliveries, Invoice for goods delivered and require payment in accordance with section 4, (Terms of Payment) above. Unless the Customer notifies The Supplier of alternative arrangements, all goods will be despatched to the Customer invoice address. Failure on the part of the Customer to notify the Supplier of the correct delivery address will result in all associated delivery costs being passed on the Customer. Details of damage and short delivery must be notified the Supplier as per paragraph 6.2. The Supplier shall not be held liable for any consequential loss. Notification of such claims must be in writing. Due to the perishable nature of the goods, being supplied the Customer is beholden to accept delivery of goods when the Supplier is in a position to fulfil the order. Where re-delivery is required, the Supplier reserves the right to pass any additional charges to the Customer. In the event that a delivery is made at an agreed date and time but off loading is prevented by the Customer for an unreasonable period, the Supplier, (or their representative) may at their discretion withdraw the vehicle and Impose a charge equivalent to the transport cost incurred. The Supplier hereby gives notice in the course of processing an application by the Customer for a credit facility that it may undertake credit vetting procedures which may include the use of third party databases and other information. The Supplier deems that permission for such credit vetting procedures has been granted by the Customer, either upon the receipt by the Supplier of a form applying for a credit facility or by any order placed by a customer. The buyer must ensure correct stock rotation as we are unable to give refunds for stock that remains unsold after its ‘best before’ date.